Clock Recovery and Carrier Detect Facilities. 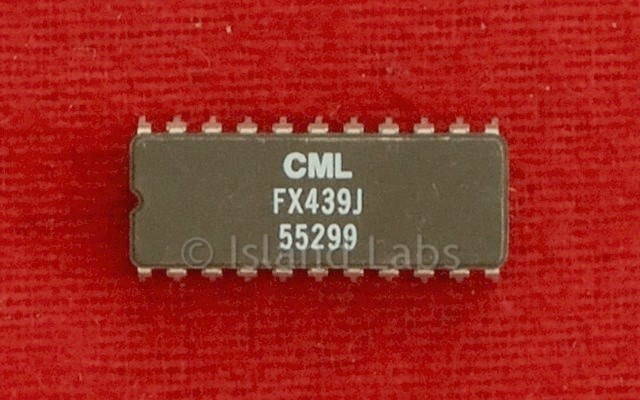 The FX439 is a single-chip CMOS LSI circuit which operates like a 1200 baud FFSK modem. The mark and space frequencies are 1200Hz and 1800Hz phase continuous, and the frequency transitions occur at the zero crossing point. The transmitter and receiver will work independently, thus providing full- duplex operation at 1200 baud. The baud rate, transmit mark and space frequencies and TX and RX synchronisation are all derived from a highly stable Xtal oscillator. The on-chip oscillator is capable of working at one of two input frequencies, from a 1.008MHz or 4.032MHz external Xtal/clock input, frequency being pin selectable with the ‘Clock Rate’ logic input. The device includes circuitry for carrier detect and facility for the RX clock recovery. An onboard switched capacitor 900Hz to 2100Hz bandpass filter provides optimum carrier filtering. The use of switched capacitor analogue filters and digital signal processing results in excellent dynamic performance with few external components, the CMOS process and current saving techniques offer low standby supply current for portable battery powered applications.